'An Tigin' means Tiny Cottage in Gaelic, but this one has a big heart within its cozy, cheerful, waterfront interior. A Saturday to Saturday rental in high season (June-Oct) offering a "Pet Free" Environment for those with allergies. Curl up by the woodstove to watch the tide change from low to high and back again. Bring back lobster & enjoy the view from the deck. Enjoy the feeling of island living all with comfy beds, comfy furniture & new appliances (2009). Our property is approx. 1.5 acres, water views on the one side and woods on the other, a little of both of what Mother Nature can offer. Easy access path to the water, no cliffs or dangerous rocks to fall from here. A nice view across to Capitol Island and Squirrel Island beyond. A safe little 'harbor' between Capitol & Southport Islands, perfect to swim or kayak in if you are apprehensive about strong currents. Sit on the rocks or the deck in the morning with a cup of coffee for a peaceful start to the day or a glass of wine to relax the evening away.Our deck is south facing, so sunny for sun bathing and this is the leeward side of the island, so no strong wind to upset a meal on the deck. Listen to the gulls crying or the lobster boats in the distance, a sound to be truly memorable. Use our kayaks or bring your own & discover the inlets around Southport. Only a short drive to a few beaches for relaxing and swimming, fish off the Swing Bridge. Beautiful flowers in abundance in my gardens and plenty of songbirds in the trees, along with peace, quiet & the ocean, what more can you ask for? Great place for walking, & don't forget the camera for those beautiful landscapes. Slow down, take a deep salt air breath & relax, you are at 'An Tigin'!! Upon booking, you will receive by me, my terms of agreement & Booking invoice with all information re: rates, fees. This means that my agreement and booking invoice "supercedes any" information fees, cancellation policies, security deposits that both HomeAway & VRBO state. PLEASE READ ON FOR MORE IMPORTANT INFORMATION!! Please open all tabs on my listing to see details of mileage to airports, stores, calendar, rates as it is all on my listing. Due to Short Term Rental Homeowners Insurance costs, I am sorry to say I am no longer accepting children six years and younger. So, please let me know their ages. Thank you! Please also be advised that my listing has some incorrect information re: providing a crib. I no longer provide this, but I am not able to correct this on my listing, sorry for the inconvenience. Sorry NO pets, due to family allergies, no exceptions. Things to See & Do in Boothbay: What is there not to do in Boothbay Harbor!!! Southport has a swing bridge with a fantastic view, great to fish or daydream from, three lighthouses can be seen from various island locations. Southport also has a small, clean beach close to a lighthouse, fun for swimming, shelling and enjoying the view all without leaving the island. For those of you who have children 7 yrs and older, we have an aquarium, mini-golf and a Railway Village (small railroad station) close by. Shops & restaurants galore. Boat trips, both power & sail leave the harbor all day long. Kayak rentals to go out on your own. Charter a fishing boat for the day. A world class Botanical Garden and many Land Trust hiking trails. Antique shops and flea markets too! Take a day trip to Monhegan, a trip worth experiencing, a step back in time!! The entire Boothbay peninsula has so much to offer and such beautiful scenery you have to go no further than that, but if you do want to head out further, it is a great base for sightseeing! Short Stay rentals in shoulder season: During shoulder periods where 3 or 4 days rentals can be booked, the dates must be consecutive and within a Saturday to Saturday period. If dates booked straddle two weeks a $75 fee will be charged. An example of this is a Friday arrival, departing on Monday, this takes up two separate weeks where a full week booking can be otherwise made, if you book more than seven days and would like more days, you are able to cross over into another week at no extra charge. Our season is so very short here that to 'chop' up full Satruday to Saturday weeks will only lose potential bookings. I hope this poses no inconvenience to future guests, but a financial fact of home/cottage rentals. Brooke, check your box for reply! About Brooke, check your box for reply! Born and raised in Ohio we first came to Maine in 1968. I absolutely fell in love with Boothbay Harbor as a child. I brought home small stones, shells and sand to remember my time spent there. I moved to Boothbay Harbor in 1989 permanently and have never regretted it. I am fortunate to be able to live here, I am an artistisan/craftsman and find my inspiration on the shores of the region. My family came to Maine every summer since 1969, though accidentally as we were heading to Nova Scotia and we had to find a destination for the night. Thankfully it was the Boothbay Region. A few years later after spending a few trips at hotels on Southport we found a property to rent very close by, this we did for ten years. One year the day before we headed back home there was a 'For Sale' sign up on this property, it was on the water, had a little over an acre, but the building was an old car garage. Well, once a car garage, now a cute little cottage. My parents in 1978 bought it, only 5 yrs later my dad died, so my love for this place took over. I was the one who took responsibility for its care. My mom remarried a few yrs later and they bought a summer home nearby. I continued to Maintain this little cottage, it was a place I connected to my dad. After my mom died in 2010, thankfully I was the recipient of the cottage. Since I took care of it all those many years and my mom saw how much I loved it and cared for it, she knew who it needed to belong to for that I am very thankful! View more about Brooke, check your box for reply! Small, but sunny bathroom is close to the bedrooms for night-time ease. Bathtub is an old fashioned ball/foot tub, which is great for a long soak looking out at the trees after all that sightseeing or swimming in the ocean. Shower head is attached at the wall for shower use. A stool beside the tub for stability for those not as 'able' as others to get into and out of the tall sided tub. In a tiny, cozy summer colony setting. Front view of cottage looking towards Boothbay Harbor, deck view looking off towards, Capitol and Squirrel Islands. Sits on about 100 yds tidal waterfront. Tidal waterfront property. Overlooking Capitol Island from livingroom/deck and beyond to Squirrel Island. Diningroom has a distance view towards Mouse Island and the direction of the harbor. We have a land line for incoming or local outgoing calls. Cell phone service in the entire Boothbay Region is very spotty, so limited use is available to you. The cottage has linens for all the beds, including extra blankets and pillows. For your own comfort it is best to bring your own pillow. White towels, wash cloths and hand towels are provided. I also provide dark colored towels to help with sunscreen usage. Cozy woodstove ambience on a chilly, foggy night will cheer up the soul and take your stress away! Local wood can be purchased at our grocery store or some small businesses. I do provide coffee filters for your convenience. I have a small container of different herbs, spices, salt/pepper for your convenience. My kitchen is very small, but it is equipped with all the conveniences to make even the most advanced meals. Water view from dining table and a beautiful view of the seasonal flowers in the garden while you enjoy your meals. A single person kayak & a tandem kayak, with paddles. Tandem kayak has rigging for fishing poles, bring your own fishing pole. Sunny south facing deck with table chairs for 4 and two chairs to relax in after a long day! Enjoy the tide changes, from high to low tides. Though my cottage is wheelchair inaccessible, it is very easy to walk to the cottage from the car and due to it being on one floor, and very small, for those not needing a wheelchair, but have mobility deficits, this could be very comfortable. A two-person (tandem) kayak & a single person kayak also available for guest use. Tidal waterfront property good for launching the kayak in near or high tides, no current or waves in our tiny cove while getting into or out of the kayak. Cards & some grown up games. An Tigin has a small Rinnai (heating system) to take the chill off in very cold weather, though the wood stove is quite ample for summer/fall use. Small video library for the kids (7 and up) and adults. And Please, Due To Family Allergies!! Absolutely NO PETS Allowed! No Exceptions Please!! ‘An Tigin’ is a lovely cottage in a beautiful, tranquil setting. Thank you, Brooke, for a wonderful week at your sweet cottage. Everything was perfect, from the clean and bright rooms to the well equipped kitchen. And the washer and dryer were an added bonus! The setting is so tranquil, with incredible views of the water from the deck. Sunsets were amazing. Your lush gardens made me smile every morning when I went out for my daily walks. It truly is a little sanctuary, and I felt renewed after my stay. The love and care you put into ‘An Tigin’ is apparent, and I will recommend it to my friends. Thank you again! ~Helene F.
Thank you for your very kind remarks. I continue to strive for a wonderful retreat for my guests and the region. I hope to host you again some day! We really enjoyed the cottage--cozy and comfortable. Great location-beautiful gardens. Would have liked taller lamps in living room so reading would have been easier and bed in master bedroom was a little narrow for the two of us but we managed in both cases and plan to return next summer. Thank you for your kind review and the nice note you left on the table. I wished I would have known you needed better lighting. Because I am trying to enhance charm, the lighting is cozy, but may be a bit darker for those who read. I have a couple reading "gooseneck" lamps for my guest's use, but have no room to store them where guests can get at them, I will re-arrange the shelves in the kitchen area to accommodate extra reading lamps for guest use next year. So thank you for bringing this to my attention. As far as the beds go, "An Tigin" means "Tiny cottage" in gaelic, so a bed larger than a queen won't fit well in the bedroom, so I won't be able to help with this issue. Two twins and a queen is all that the cottage can fit comfortably. I do hope to see you again next summer!! We were looking for a quiet, relaxing holiday and that's what we found at An Tigin. Brooke was so very helpful through the whole process, and the cottage exceeded all our expectations . . . roomy enough for a family of 3, extremely neat/tidy and the view! We loved the Boothbay area and when we visit the area again, we hope An Tigin will be available! Thank you for a great holiday! Thank you Kris! I am happy to hear you had such a nice time at An Tigin! I am pleased to know my guests enjoy what I have "put into it", as this is my special place. I would love to have you back as guests again! Thank you for choosing "An Tigin"! My husband and I stayed for two weeks this summer and loved the property. It's very charming and comfortable inside. We appreciated the evident love and care the cottage and gardens receive! We enjoyed the grill on the deck and watching the tides whoosh in and out of Pig Cove. The location is wonderful and kayaking around Capitol Island and to Burnt Island was the best. The walk around Capitol was one of my favorite things of my vacation. We want to go again! Thank you Brooke! Thank you Leah! I am happy to hear you enjoyed your stay! I hope to see you again someday at "An Tigin" and perhaps a cup of tea on the deck so we can chat a bit as well. My husband and I stayed in this cottage in October of 2015, and have found our home away from home. The pictures are representative of the cottage, but can't capture the peacefulness, the clean crisp air, and the joy of star gazing from the deck! Clean and tidy, and a kitchen with everything you need. The washer and dryer was a plus. Lovely walks, kayaking, seafood, glorious scenery all easily accessible from this cottage. Hope to stay often, on our treks through Maine! Thank you Cheryl & Bob for your nice review. I am happy you enjoyed the cottage and its surrounding area. This cottage is my heart and soul and I truly hope my guests see it the same way I do. I always have a project inside or out to make it more special or at least try. I hope you have a wonderful stay this upcoming October and you can see more of what we have to offer in the region and beyond. 'An Tigin' is located on Southport Island, travel over the swing bridge with scenic views to a beautiful island where peace will calm your soul. 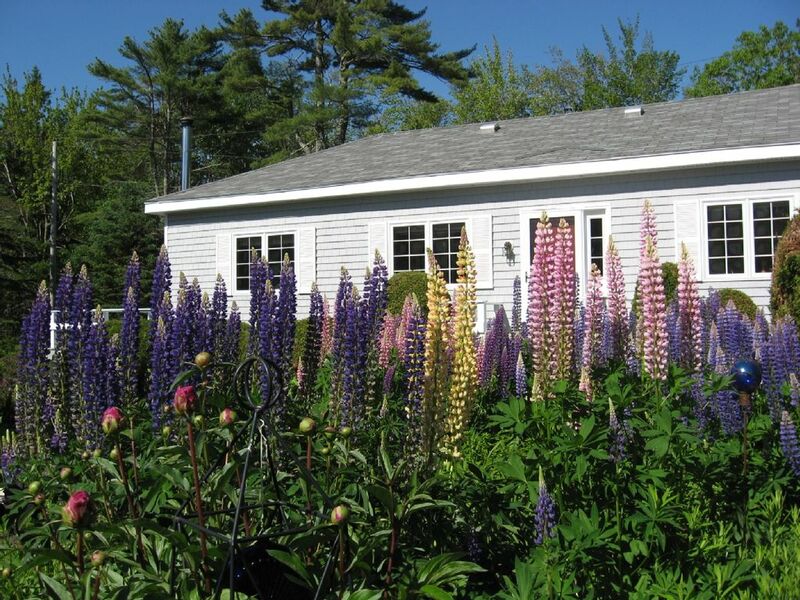 The small, cozy, quiet neighborhood is nestled on the leeward side of the island with distant views into Boothbay Harbor & overlooking other beautiful islands. Many guests love this neighborhood and comment how nice it is and how peaceful it is here. We are located just 5 miles from town, a nice scenic drive into Boothbay is just 10 minutes away. The 'Town' is where it all happens, shopping, restaurants, boat trips, aquarium, kayak trips, you name it, Boothbay Harbor has it. The property is a little over one acre, most of it in a wild state with wildflowers, plenty of evergreen trees, a nice lawn with two gardens & many flowering shrubs for the butterflies and birds to enjoy. Great for the birdwatcher & garden lover. Cute cottage, super location and peaceful. Our family cottage sits at the far end of the property, we stay there in order to be close to help with guest questions or finding activities for them in the region. #1 Please Do NOT use Instant Booking, I prefer to have e-mail contact first. #2 An agreement with all terms & conditions that SUPERSEDE THE GENERIC POLICY BY VRBO/HA will be e-mailed to you upon making your booking reservation. #3 I REQUIRE a $500 security deposit via personal check sent within 5 days along with the rental agreement for "An Tigin", this clause will show up on my listing as "No, Damage protection not required", B-U-T there is no choice for property owners to declare this issue. If you do not send the $500 security deposit and the signed agreement, there will be no key instruction for the guests. #4 Cancellation Policy: Guest agrees "time" is critical for seasonal short term vacation rentals, and that the Owner has kept the "property" off the market for the term reserved by guest. Please read cancelation clause in "An Tigin" rental agreement and the Travel Insurance for your protection prior to booking. #5 I do rent "An Tigin" prior to and after peak season time frame. Minimum is a 3 day stay. Rentals are from SATURDAY to SATURDAY from June-mid-October, being my high season. I am sorry that neither VRBO nor HomeAway reflects that arrivals for high season are only Saturday to Saturday, shoulder season arrival dates can be accepted. Thank you! #5 Please ask about age of children as I no longer accept children less than 7 years of age.